and who makes the music? I was working with a client who had made a move that broke a habitual pattern in her life. She had called me asking me for some support as she was internally disturbed. She had recently renegotiated a business relationship. As a result, her vision for her future had changed. She was feeling sad and scared as a result of her actions. There was also a nagging guilt as she was judging she had deeply disappointed the other person. I encouraged her to move her attention to the rise and fall of her chest. I asked her to tune into the breath that is underneath all of the range of feelings she was experiencing. Suggesting she imagine a blank canvas with paint sitting atop; the colors dancing together to create a picture. I asked her if she could feel the blank canvas as the ground, the support, a foundation holding steady while the paint was being moved around on the canvas. I then proposed she imagine there was a painter who had decided to change the picture. In this moment, with her feelings all astir, the paint is being redistributed. Perhaps the movement of her emotions was the result of paint being added to, taken away from the picture she thought she was living. The emotion, or energy-in-motion was merely life happening as it shifts into something next. I asked her if she could hold steady like the empty space of the blankness of the canvas while the paint was being moved around? As she accessed her breath she was able to go to the place inside of herself that doesn’t move. A place that is steadfast; solid underneath the movement of life’s happening. She was able to drop into the peace that sits underneath the movement of life. From this place she was more easily able to allow the movement rather than upsetting herself that there was disturbance. Of course there’s disturbance in life. Life is continually upsetting us; waking us up to something new, something next. If we allow life to flow through us and take us to where it wants us to go, we create an energy field of grace and ease. The disturbance calms down more quickly and we flow in the direction that life is taking us. Instead of trying to swim upstream, we can cooperate with life’s movement. We can lay on our back, look up at the sun, enjoy the journey. There is something greater than all of us that is painting the picture. 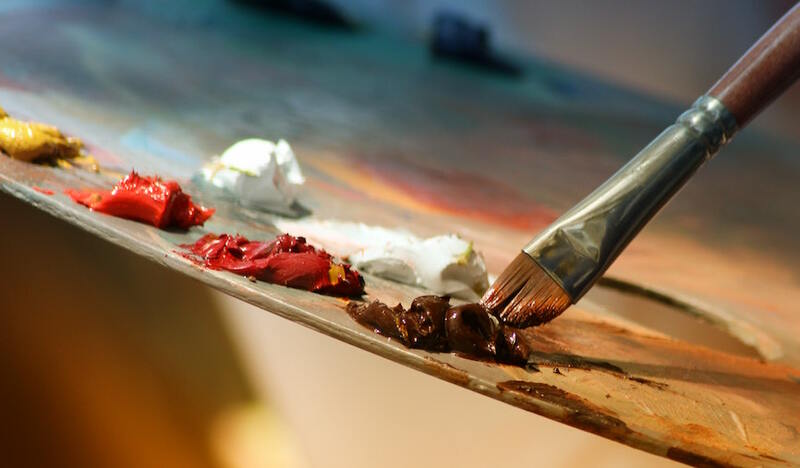 The movement of paint on the canvas is akin to the ever changing circumstances of our lives. We have a choice as to how to relate to the movement of life happening. B) We can accept and cooperate with life happening. We can hold an inner steadiness as life does what it does; participating from a place of personal integrity; doing what it is that is ours to do to contribute to the next expression of the painting as it revealed. We all have the same choices. We get to live in the consequences of those choices. It takes courage to face the reality that if we’re not living in peace and joy, we are the problem (and also the solution). It’s much easier to blame life happening as the reason for our disturbance. For me, I am committed to learning to allow the artist that paints my life to have its way with me; trusting the ever-changing movement of life.